In September and October 2012, I was invited for a second residency at Guldagergaard, the International Ceramic Research Center in the charming town of Skælskør, Denmark. My focus was on transferring my illustrations to clay with silk-screening and decals. 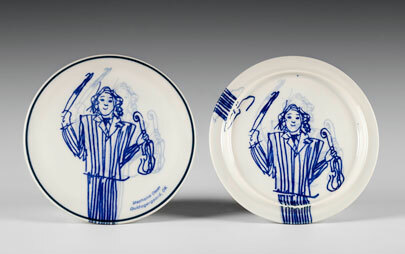 “The Fiddler”: commercial porcelain 6″ trivets re-fired with my original drawings made into cobalt and pale blue decals.